M272? It's got to be down near the South Coast of England. It's, as you might expect, located between M271 and M275. This is another of those motorways that seemed to be "on the cards" for many years, but never quite made it. This motorway is first mentioned in documentation from Southampton County Borough Council in the late 1960s as part of the development plan for the city. The public inquiry is now proceeding into the M.27, past Southampton towards Brighton. That not only needs to be pushed ahead as a motorway, and not only, may I say in parenthesis, properly fed by the Ports-wood Link from Central Southampton, but should be extended as a dual-carriageway from Brighton to Hastings, so as to be ready for the Channel Tunnel so that Southampton and the Tunnel can communicate, as well they should. Of course, the good Lord isn't quite right in his comments. The M27 was only ever meant to go as far as Chichester, but his words regarding the Portswood Link are correct. The first mention of a number is in a White Paper of 1972 where it is allocated the number M272. The route was designed expressly to get traffic in and out of Southampton city centre effectively. Whilst there were junctions along the route, they all faced out of Southampton so that local traffic within the city would not be attracted to it. It was designed to be three lanes wide in each direction, and would have been constructed in two stages - first from the M27 to A33 The Avenue, and secondly from there to its final southern terminus near the Docks and the Central Station. It was also expected that there would be a 50mph speed limit on the motorway. In 1974, a new council was elected for Southampton after local government boundary changes. Suddenly, the local authority were no longer in favour of M272. And then they appear to have been picked up again in the 1980s! There is a rather mysterious road called the "M27 Swaythling Link" that suddenly begins to appear in central government documentation in 1981 as a "scheme for which draft line order has been published". The plot then thickens. 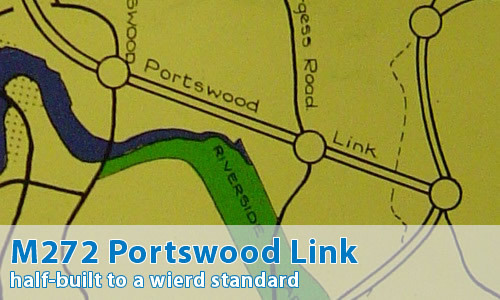 The publication "Roads in England: 1985" mentions the M27 Swaythling Link as being proposed, and the map along with it shows a north-south motorway route approximately on the line of the old M272 Portswood Link. Just to completely confuse the issue, in documentation dated 1993, the contract for "M27 Swaythling Link" is listed as being to Walcon Construction Limited in 1988, some two years after the date that it was listed as being completed! One thing is certain - the references to M27 Swaythling Link (or Swaythlink as I keep saying!) come to a sudden stop when the A335 Thomas Lewis Way was opened in 1989. Because Thomas Lewis Way is right on the line of the original planned M272 Portswood Link. It's a very, very strange road to drive down. It's single carriageway, with roads passing over the top of it that every so often crashes into a set of traffic lights. It's kind of hard to describe why it's odd, but trust me, it is! So what route would the M272 have taken? Another "it could have been so good" motorway. I travel this route into Southampton from the East and often think how it might have been. The speed limit on the single-carriageway A335 was even at one point reduced from 40 MPH to 30MPH in the mid-nineties, before (thankfully) being returned to its current speed limit. I find this rather strange, as it could easily be at least 50. Still, it remains in my opinion the fastest and easiest way into the City from the East. Indeed, Thomas Lewis Way is strange. Inbound, it is interrupted by the lights of which you speak, and then it dumps you unceremoniously into Bevois Valley Road. The lane widths at the two sets of intermediate traffic lights are scarcely wide enough for two cars, never mind anything larger. Outbound suffers from peak hour queues at the very first set of lights when leaving Bevois Valley, and then again where it meets the A35 at Swaythling. All in all, a funny sort of a road. I went to university in Southampton and lived in Portswood for 2 years. Thomas Lewis Way is indeed a very strange beast - it smacks of being a cost-saving and sub-standard "version" of a motorway.